From Autostrada A11 - Exit "Prato Est"
Leave tollgate area taking the left lane and enter the large boulevard lined with trees. Stay in the right lane, and after 500 m, before the underpass, go right heading NORTH toward the hills (V.le Repubblica). After 2 km pass through a tunnel under the railway. Go left through the large roundabout heading WEST (V.le Borgovalsugana/Lambruschini). Continue straight for 2 km where the road bends right. Go right at the small roundabout (DO NOT CROSS THE RIVER) and proceed 150 m to a small piazza with an obelisk.. Turn left in front of the obelisk (Via del Palco) following this street (about 500 m) keeping to the right. Follow sign "loc. Canneto" to the right up the narrowing road on a short, steep hill. After the Trattoria La Fontana continue for about 2 km (Via di Canneto) to "Villa Rucellai". 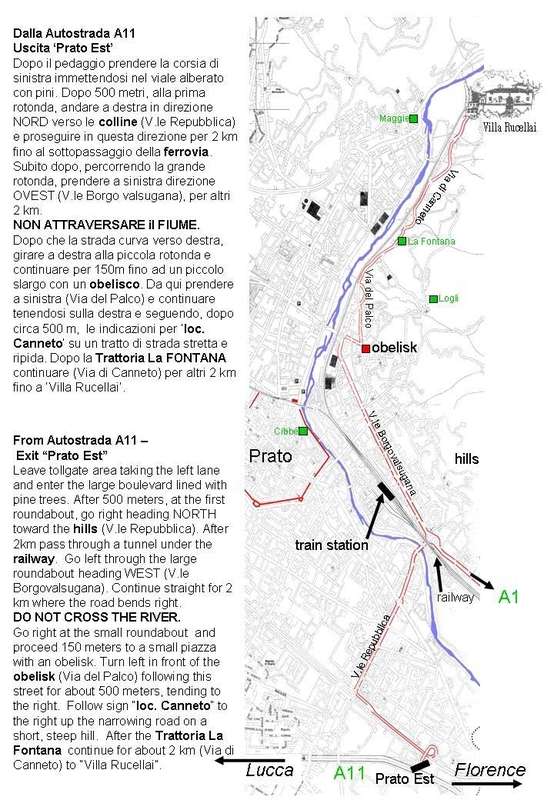 If using GPS to arrive, please enter Via del Palco (not via di Canneto) to follow this route. Via di Canneto is the continuation of Via Del Palco.